Jeffrey Yoskowitz and Liz Alpern. Spiritual sustenance can be found this Passover beyond the comforting familiarity of your favorite Haggadah. This year, when planning menus for the seders and every day, make sure to pick up your manifesto—The Gefilte Manifesto , that is. 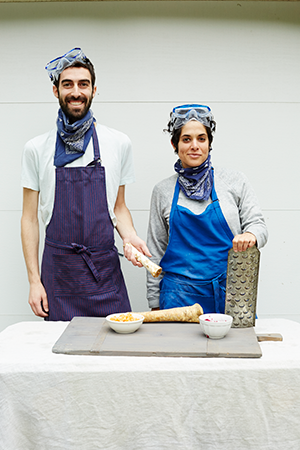 The new cookbook, authored by a pair of young New Yorkers with decidedly old souls, is intent on returning traditional Ashkenazi cuisine to its rightful roots. Soon they were updating old-country throwbacks like beet kvass, a fermented drink they refer to as the “original kombucha,” and carrot-citrus horseradish. As they shared their food and philosophy with an ever-growing audience at cooking demonstrations and pop-up events, they realized the next logical step was a cookbook. The Gefilte Manifesto features close to 100 delicious recipes and a witty back-and-forth between the two authors that is almost talmudic in nature. “I think we even mention Hillel and Shamai in the book,” joked Yoskowitz. One comes away from the book feeling empowered to explore the roots of Eastern European Jewish food, which has its origins in Germany, Russia, Poland, Belarus, Lithuania, Hungary, Ukraine, Romania and beyond. Its makers were primarily religious, poor and Yiddish speaking. Seasonal produce was a way of life, and Jews foraged for shoots and leaves depending on the time of year long before the concept became trendy. In the process of writing the book, the duo did extensive research, reading family histories and scholarly books about Ashkenazi Jewish traditions through the ages. “We’re so disconnected from the land and from our European past,” said Yoskowitz. “In Eastern Europe, you could get amazing porcinis and other mushrooms, wild blueberries, horseradish in spring and fall, wild leeks and scallions.” Poorer Jews also foraged for short-season greens like sorrel. This new understanding led Yoskowitz and Alpern to reinvent many traditional recipes—including these Passover dishes—to include more vegetables and herbs. In the process, they’ve lent a culinary depth to Passover. 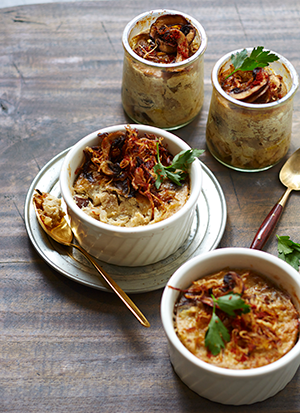 One example is their cauliflower mushroom kugel, which is far lighter than its similarly named culinary siblings. And, of course, the authors give everyone’s beloved gefilte fish a makeover. To streamline the process, they begin with skinless fish fillets, a far cry from the carp-in-the-bathtub stories of yore. 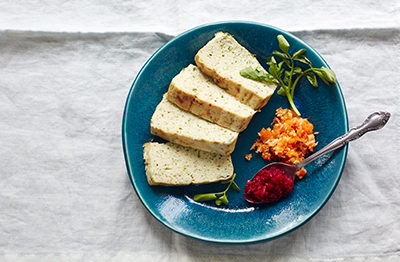 After making this perfectly textured loaf, with just the right amount of sweetness and a generous handful of fresh herbs and greens, you’ll never open another jar of gefilte fish again. Adeena Sussman is a cookbook author, recipe developer and food stylist based in New York City and Tel Aviv. Her latest cookbook is Short Stacks’ Tahini . 1. If there are any bones left in your fish, remove the larger ones by hand, but don’t fret about the smaller ones since they’ll be pulverized in the food processor. You can buy your fish preground from a fishmonger (usually a Jewish fishmonger) to ensure all the bones are removed, but try to cook your fish that day since ground fish loses its freshness faster. 2. Place the onion in the bowl of a large food processor and process until finely ground and mostly liquefied. Add the fish fillets to the food processor along with the rest of the ingredients, except for the horseradish. Pulse in the food processor until the mixture is light-colored and evenly textured throughout. Scoop into a bowl and give it an additional stir to ensure that all the ingredients are evenly distributed throughout. 4. Place the loaf pan on a baking sheet on the middle rack of the oven and bake for 40 to 45 minutes. The terrine is finished when the corners and ends begin to brown. The loaf will give off some liquid. Cool to room temperature before removing from the pan and slicing. Serve with horseradish relish. * The whitefish here refers to the species Coregonus clupeaformis from the Great Lakes. If you can’t find whitefish, substitute hake, sole, flounder, whiting, tilapia or halibut. 1. Preheat the oven to 350°. Bring a large pot of lightly salted water to a boil. Add the cauliflower and boil until the florets are tender but not mushy, 5 to 7 minutes. Drain the cauliflower thoroughly. Place it in a food processor. 2. In a medium pan, heat the oil over medium heat. Add the onion and sauté until translucent and lightly golden, 7 to 10 minutes. Add the mushrooms, salt and pepper and cook, undisturbed, for at least 1 minute to help the mushrooms darken. Cook, stirring occasionally, until the mushrooms are browned and their liquid has evaporated, 5 to 7 minutes more. 3. Transfer the mushrooms and onion (and any extra oil from the pan) to the food processor with the cauliflower. Add the eggs and egg yolks and process until the mixture has a smooth consistency with minimal clumps. (If you do not have a food processor, mash the vegetables, eggs and yolks together with a large fork or spoon until the mixture is as smooth as possible.) Transfer the mixture to a large bowl, stir in the matzah meal and mix well. 4. Grease six 8-ounce ramekins or a 9-inch glass baking dish. Fill with the cauliflower-mushroom mixture. Each ramekin should hold a little under 1 cup of the filling. Tap the bottoms of the ramekins or baking dish against the counter so that the top of the kugel flattens out and you’ve released any air bubbles. If using individual ramekins, place them in a roasting pan with at least 3-inch-high sides. Pour boiling water into the pan to come about halfway up the sides of the ramekins. Bake for 55 minutes to 1 hour. The kugel is done when a toothpick inserted into the center comes out clean and the kugel is lightly browned on top. Take out of the oven carefully, remove the ramekins from the water and let cool slightly. 5. If using shallots, while the kugel is baking, slice them as thin as possible (if you have a mandoline, use it here on the thinnest setting). In a small nonstick pan, heat the grapeseed oil over medium heat. Immerse the shallots in the oil and fry them, stirring frequently, until they are crispy, crunchy, shrunken and dark in color, 15 to 25 minutes. Transfer the shallots to a paper towel-lined plate to drain and sprinkle lightly with salt. Set aside until serving. 6. Garnish the kugel with the fried shallots (if using) and the chopped parsley. Recipes and photos excerpted from the book The Gefilte Manifesto: New Recipes for Old World Jewish Foods by Jeffrey Yoskowitz & Liz Alpern. Copyright © 2016 by Gefilte Manifesto LLC. Reprinted with permission from Flatiron Books. All rights reserved. Photography by Lauren Volo. I have cooked many of the recipes from this book and every single one is amazing. Not being huge on bland cooked or steam veggies, I cringed at the idea of cauliflower kugel, but only ever having Farfel Kugel or Lokchen Kugel I knew I had to give it a go and boy am I glad I did! This was amazing! Who know I would go nuts for cauliflower! Whether it’s their Seeded Honey Rye Pull Apart Rolls or their Crispy Chicken Tsimmes you can’t go wrong. If you are wanting to reconnect with your Jewish heritage through food this is the best cookbook I have found to do just that. If you bake it in the 9″ pan, do you also need to put the pan insied another water filled pan? Does it also need about 55-60 minutes to bake? Made 2 batches of the Herbed Gefilte Fish Baked in a terrine for the Passover Seder. I increased the amounts by 1/3 and froze one unbaked. After defrosting the frozen one, it baked beautifully. A lot of requests for the recipe. By the way, what do you do with the liquid that’s given off? This will now be my go to gefilte fish recipe.